On the afternoon of Saturday 4th June we’ll be heading out onto Tooting Common to take part in Friends of the Earth’s month-long Great British Bee Count. Bees are a crucial part of our ecosystem, helping to pollinate many of our main crops. But after years of neglect we have already lost at least 20 species of bees. Join us to see what bees we can spot in south London, with species guides provided. This walk will be a fun outing for all the family – there’ll be free goodie bags and bee masks for the kids. The Midnight Run is an arts-filled, night-time cultural journey through urban spaces. 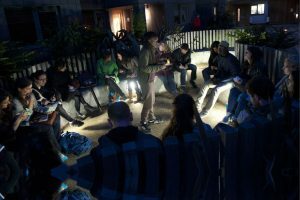 It gathers strangers and local artists/activists to explore, play and create whilst the city sleeps. Curated specially for The Balham Literature Festival, this event, led by Inua Ellams, is a walking writing workshop exploring literary histories and talking points from Balham to Brixton.